Co-Optimus - News - Possible Survival Mode in Borderlands? 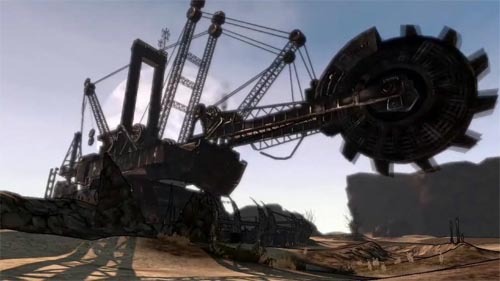 It seems Borderlands is including a co-op survival mode of sorts. These game modes (like Gears 2's Horde and Halo 3 ODST's Firefight) allow players to team up against waves of enemies, to see how long they can last. This snippet from IGN's Borderlands preview seems to indicate there'll be something similar in Borderlands. I even wound up discovering a fighting arena in one part of Pandora, where I was challenged to survive waves of enemies in an enclosed space and given a reward at the end, though it proved far too difficult for my level and gear. Yup, that sounds like a survival mode to us! As the release date for Borderlands approaches, many hands on previews are showing up. Here are some particularly juicy bits we found interesting. What keeps me intrigued, makes me want to come back again and again are all of those weapons. Those glorious weapons. There are, by some accounts, more than 3 million variations of weapons in the games. And some do some pretty amazing things. All of them have great, randomly generated names like my machine gun "Bone Shredder", my electrified-bullet shooting sniper rifle "LB20 Static Wrath" and my brutal six shooter "MAL31-B Blast Law". I know that Modern Warfare 2 is the top game on everyone's mind for the rest of the year but Borderlands is shaping up to be as good as what Infinity Ward is creating if not a better change of pace. The game isn't perfect but you won't notice the few flaws the game has because you're having so much fun playing the game. I was late to work on at least three separate occasions because of "Just one more mission" syndrome and I have a feeling I'm going to be losing hours and hours of my life when the game ships in October. Playing with other people added quite the tactical punch to the game, and allowed you to explore your special abilities and take on missions together. Again, this is very much like a first-person Diablo; if you have a tight group of gaming friends, you may have found your next addiction. "We do have a single player plus, I guess you'd call it. The level cap is 50, but you beat the game around 31 or 35, somewhere around there. Then you can restart the game and do New Game Plus where everything's 35 to 50 on the second play-through." Page created in 0.2913 seconds.